It was fun watching Pasta last Sunday. She was creeping into the kitchen and was coming back with a smiling face! I was curious, needless to say! My house-help told me to thank the jar full of Aam Kasundi aka Bengali Green Mango and Mustard Sauce for Pasta’s smiling face! She actually had finished 2/3 from the fresh batch of the condiment! Well, I actually am happy seeing her to enjoy the true blue Bengali Relish! something her bong parents grew up eating and cherishing with! 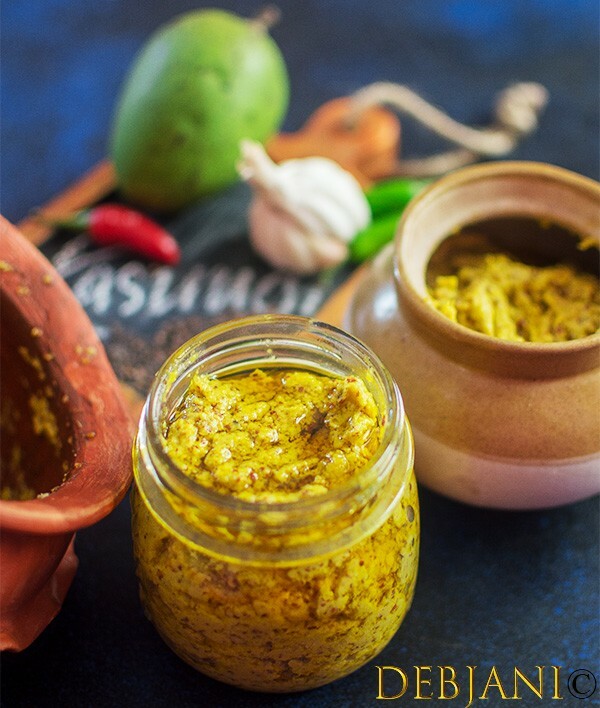 Aam Kasundi aka Bengali style Mustard Sauce prepared with Mango is something Pasta is savoring these days! It, in fact, is quite funny seeing her creeping into the kitchen and coming back with a spoonful of Aam Kasundi every now and then! Rosie, my house-help informed me about Pasta’s kitchen venture day before. I was both shocked and happy to see her enjoying the Aam Kasundi I made a few days back! At least, I know, the Kasundi is worth having! I started making Aam Kasundi during our Gurgaon Days. It was not that Kasundi or Aam Kasundi was not available in the market. However, I never liked the smell of preservative in Kasundi and always preferred the homemade version. In my portion of Kasundi, I don’t like the smell of vinegar! Neither I like Kasundi prepared or pre-cooked with spices. My Aam Kasundi is all about natural fermentation. I use handpicked green mangoes along with the Mustard seed, ample of Mustard Oil, Salt, Sugar, and Garlic to make it. My Mango Mustard Sauce does not call for preservatives! The recipe though adopted from Dida but Garlic is my addition to it. 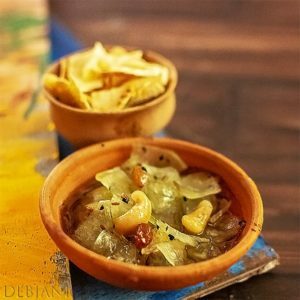 I had never seen Dida using Garlic while making the Pickles or other condiments. She was a Bengali widower and till her last breath, she was adamant to not to have any form of Non-vegetarian food. This, in fact, was inclusive of Garlic and Masoor Dal (Red Lentil). Dida never had those after Dadu and I have never seen the condiments prepared with Garlic at her place. I still remember Dida placing all the bottles (she used to call those Jam-bottle) of Condiments on the terrace for months before using 🙂 . Visiting Mamarbari for sure was full of those treats back then. Now to see Pasta enjoying the Kasundi I prepared is kind of soul-satisfying. However, I like my portion of Aam Kasundi with Garlic. It gives unique and distinct aroma to the preparation. Coming to the recipe of Aam Kasundi, as I already mentioned I use limited ingredients. I don’t cook it instead it is a fire-free recipe of Kasundi. Here I must mention, I use a big Earthen Pot to store the Kasundi for initial seven days. This step is crucial to make proper Kasundi. Wash the Mustard seeds and sundry for 2 days. There must not be any moisture. Wash the Mangoes and dry those using a kitchen towel. Peel the Skin and cut the mangoes into small pieces. discard seeds. Now sprinkle half of the salt over the mangoes and put those over a perforated bowl for 15 minutes. After 15 minutes the Mangoes will start releasing the moisture. That liquid is to be discarded as well. 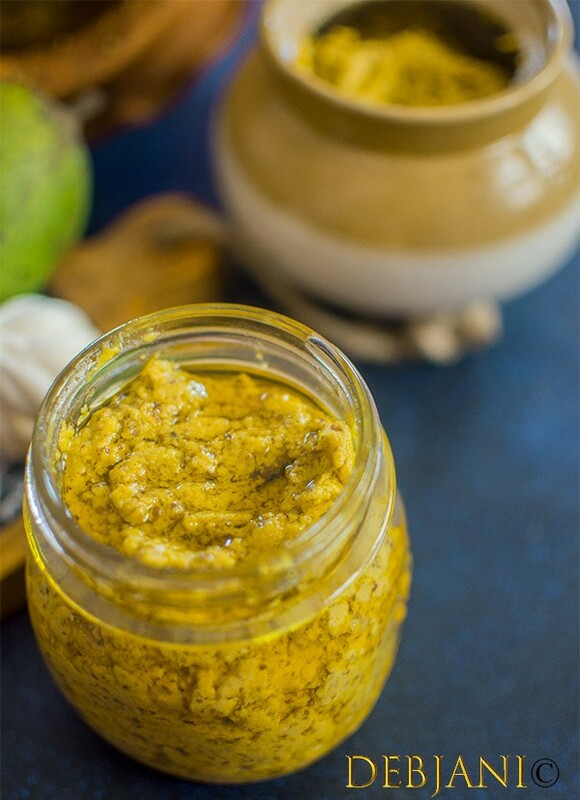 Take Mangoes along with both types of Mustard, Green Chili, and Garlic in a Mixer grinder and make a coarse paste. If required make the paste in two or three batches. Once done, take the paste in a big "Earthen Pot" and pour mustard oil over the paste. Add Sugar and salt as well and using a dry spoon mix everything. Now cover the pot with a clean cloth and keep it in the room for 7 days. You do not need to place the same under direct sunlight. 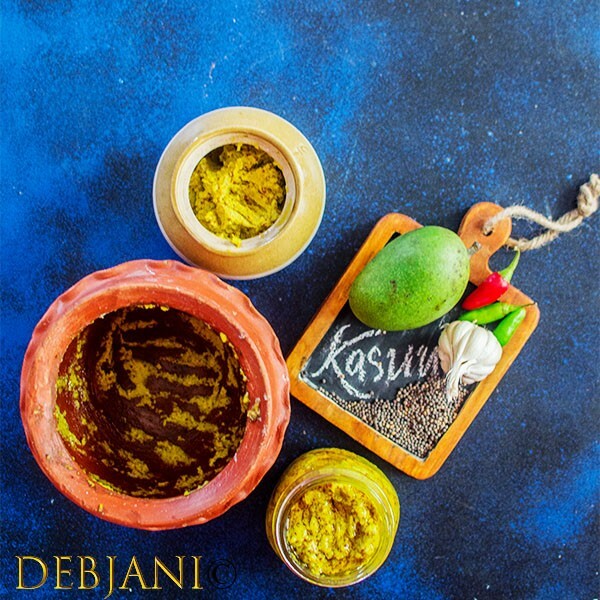 After seven days, open the cloth and transfer the Aam Kasundi in a sterilized Jar. Keep it in the refrigerator. This is to be consumed within one month of making. 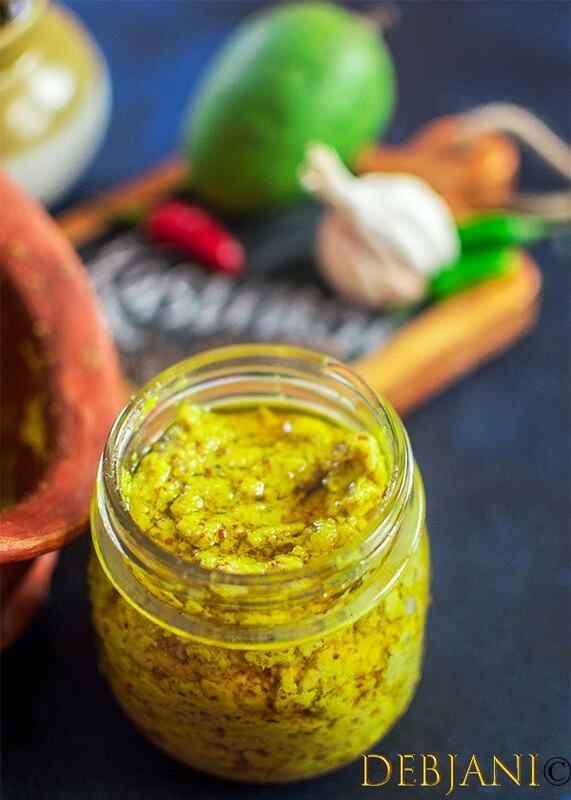 Use of Garlic is optional however, it gives amazing flavor to the Kasundi. You can adjust the green Chillies depending on how hot you want your Kasundi to be. Sugar not only enhances the flavor but helps the Kasundi to ferment. You can reduce the amount of Mustard Oil as well. The Earthen Pot helps the Kasundi to mature. This is optional but needed. It helps to absorb the moisture as well. Last but not the least, there must not be unnecessary moisture as that will reduce the self-life. 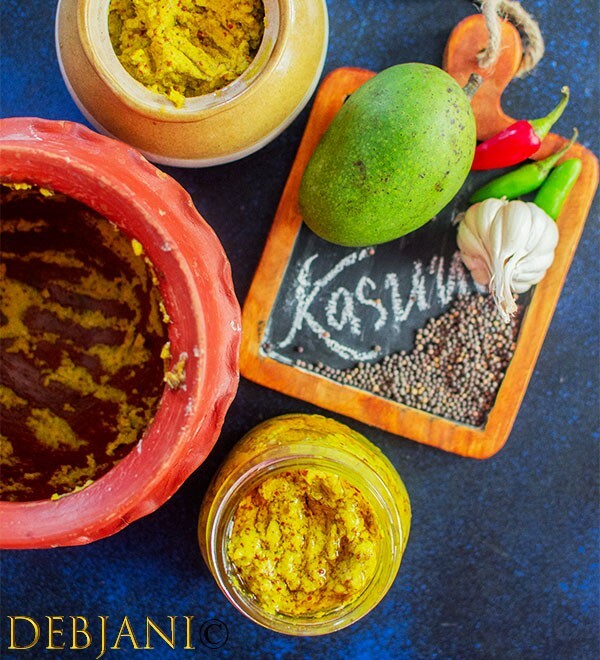 Have you tried the Aam Kasundi aka Bengali style Mustard and Mango Sauce Recipe from Debjanir Rannaghar! Do let me know how it came out. Also, I would love to see a picture of the same which you can share here on dolonchttrj@gmail.com. On Instagram, you can use my hashtag #debjanirrannaghar or can tag me at @foodofdebjani. You can follow me on Facebook, Twitter, Pinterest and Instagram for updates and recipes from Debjanir Rannaghar.